Small caps can be a useful tool for that extra bit of typographic expression, but if you don’t use them right, your plan will backfire. You’ll make your typography look sloppy, and unprofessional. “Fake” small caps can be seen everywhere these days. Many desktop publishing programs have “small caps” buttons that simply scale the capital letters down to make small caps. “Real” small caps are drawn separately from the standard capital letters in a font. The strokes of the letters are made fatter, to account for the fact that they will look too thin if the letters are just scaled down. Notice the difference between “real” and “fake” small caps in the image below. If you don’t learn the difference, you’ll likely be using fake small caps for the rest of your life, and design pros will gather in dark chambers to privately poke fun at your work. One way to avoid using fake small caps is to just not use small caps! You could always just use all-caps instead. Nobody will ever say “hey, did you notice that weirdo never uses small caps?” You’d be fine, and you could express yourself typographically numerous other ways. 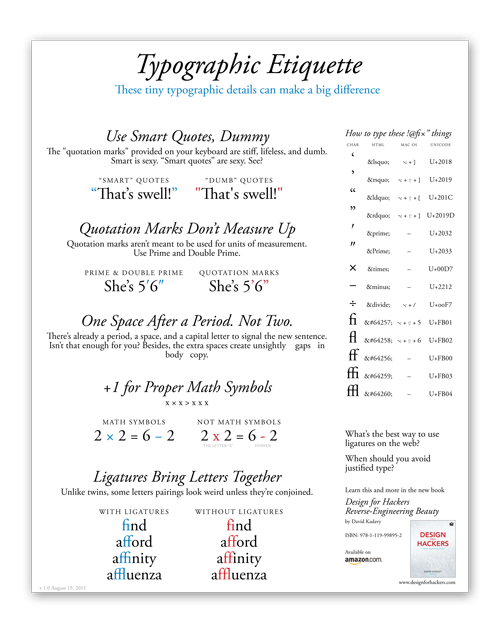 There are two different ways that real small caps can be used: you can use a special small caps version of your font, or you can access custom small caps through OpenType. If there’s a dedicated small caps version of your font, can see this in your font picker. Here’s Adobe Garamond in InDesign. Sometimes you can choose a small caps font from a font picker. However, this isn’t a foolproof way to ensure you have real small caps available. Some OpenType fonts have small caps alternates built-in. When you select “small caps” from the Character Palette in InDesign, for example, you’ll get real small caps if you’re using one of these kinds of OpenType fonts. If there isn’t a dedicated alternate small caps version, you’ll get fake small caps! Some OpenType fonts have small caps built-in. It’s very confusing, and kind of scary. It seems there’s no way to guarantee you’re using real small caps. The best method is to just learn to spot the difference between real and fake small caps. It may seem tricky at first, but once you figure it out, you’ll never miss it. If you use CSS’s font-variant: small-caps property you might think you’re getting real small caps – especially if there is a “real” version of small caps available for the font you’re using. Don’t be fooled! With the state of browsers today, font-variant: small-caps still gets you fake small caps. The trick is to make a small caps version available using CSS’s @font-face rule. Then, you can use it like you would any font. Here it is being used as an abbreviation. If you’re using an OpenType font, and know there’s a small caps variation of your font available, you can try using CSS’s “font-feature-settings” property, which has pretty decent browser support, to summon those small caps. Now you know the difference between real and fake small caps, so do with that knowledge what you see fit. Stop using small caps altogether, learn to spot difference (and act accordingly), or just go on using fake small caps (while leading a life of eternal typographic alienation and suffering). Justify text with HTML/CSS? Don’t do it! I wrote Design for Hackers to teach hackers about design. But that wasn’t the hokey pokey of it.